MPN: Kodak 3BXL Plus 3CXL. Model: 3XL. The UK's leading suppliers of Ink, Toner, Printers and Office Supplies. Type: Genuine, Original, OEM. We are proud to work closely with many of the key manufacturers. In an instant. Fade-proof properties - Laminated 4th layer overcoat locks in colour to preserve quality. Black and white, color, and paper all-in-one. Integrated photo paper. If there's a problem, just let us know and we will fix it. 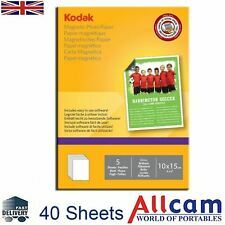 2 X Kodak Photo Print Mini 2 New Mc Cartridge Printer, Ink and Paper Pack of 20. 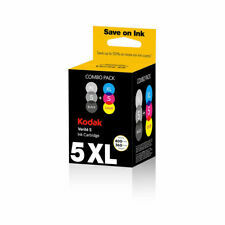 Compatible with Kodak Verite 55 Printer. Kodak Verite 55 SE Printer. Kodak Verite 55W Eco Printer. Kodak Verite 55XL Plus Printer. Kodak Verite 60 Eco Printer. Kodak Verite 65 Plus Printer. Colour - Approx. Kodak Easy Share Printer. Very lightly used Kodak printer in box with accessories. Should there be an issue with a sale, we will always do our best to resolve it fairly and amicably. Tested and in perfect working order. Kodak: ESP 3 ESP 5 ESP 7 ESP 9 ESP 3250 ESP 3200 ESP 5000 ESP 5200 ESP 5250 ESP 5300 ESP 5500 ESP 7250 ESP 9250 ESP Office 6150 Hero 6.1 7.1 9.1. Original & genuine. CAT 3949922. Manufacturer's Part No. Very good picture quality. Instant picture fun. If there's a problem, just let us know and we will fix it. Kodak: ESP 3 ESP 5 ESP 7 ESP 9 ESP 3250 ESP 3200 ESP 5000 ESP 5200 ESP 5250 ESP 5300 ESP 5500 ESP 7250 ESP 9250 ESP Office 6150 Hero 6.1 7.1 9.1. Manufacturer's Part No CAT 3949922. 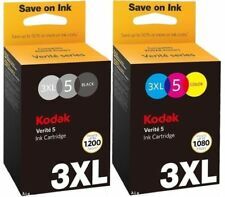 Compatible with Kodak Verite 55 Printer, Kodak Verite 55 SE Printer, Kodak Verite 55W Eco Printer, Kodak Verite 55XL Plus Printer. Colour - Approx. Black - Approx. Add To Favourites. Covered by full manufacturer’s warranty. Ink Jungle. Black - Approx. BROTHER laser printer HL 5340. BROTHER laser printer HL 5340 D. BROTHER laser printer HL 5340 DL. BROTHER laser printer HL 5320. BROTHER laser printer HL 5350 DN. BROTHER laser printer HL 5350 DN2LT. BROTHER laser printer HL 5350 DNLT. The Photo Printer Mini 2 by Kodak is here to set you free. Or use the Bluetooth connection on either your Android or iOS device to send photos wirelessly. All photos are printed on waterproof and fingerprint proof paper with an extra protective layer to ensure lasting image quality. Compatible with the following Printers:EASYSHARE 5000 Series, ESP 5, ESP 7, ESP 9, ESP 3200, ESP 5200, ESP 7200, ESP 9200, ESP Office 6100 Series, HERO 7.1, HERO 9.1, OFFICE HERO 6.1. Photo Paper. Your statutory rights are not affected. Compatible with the following Printers:EASYSHARE 5000 Series, ESP 5, ESP 7, ESP 9, ESP 3200, ESP 5200, ESP 7200, ESP 9200, ESP Office 6100 Series, HERO 7.1, HERO 9.1, OFFICE HERO 6.1. Your statutory rights are not affected. Compatible with the following Printers:Kodak ESP C110 C310 C315, ESP Series C100 C300, ESP Office 2150 2170, ESP Office Series 2100, HERO 3.1 5.1. Your statutory rights are not affected. Cancellation of Orders. Get another 250 8 x 12" prints from your 8810 or 9810 Photo Printer with thisPROFESSIONAL EKTATHERM 8810L/9810L Photo Print Kit fromKodak. This updated paper features improved details in the highlights and better color performance. Compatible with the following Printers:EASYSHARE 5000 Series, ESP 5, ESP 7, ESP 9, ESP 3200, ESP 5200, ESP 7200, ESP 9200, ESP Office 6100 Series, HERO 7.1, HERO 9.1, OFFICE HERO 6.1. HERO Series Printers. Kodak: ESP 3 ESP 5 ESP 7 ESP 9 ESP 3250 ESP 3200 ESP 5000 ESP 5200 ESP 5250 ESP 5300 ESP 5500 ESP 7250 ESP 9250 ESP Office 6150 Hero 6.1 7.1 9.1. You must be eighteen years old to use this site. If you are under eighteen, you may only use the site in conjunction with, and under the supervision of, a parent or guardian. ESP 3 ESP 5 ESP 7 ESP 9 ESP 3250 ESP 3200 ESP 5000 ESP 5100 ESP 5200 ESP 5210 ESP 5250 ESP 5300 ESP 5500 ESP 7250 ESP 9250 ESP Office 6150 Office HERO 6.1 HERO 7.1 HERO 9.1. add to favourites. Covered by full manufacturer’s warranty. Size : 165.8 x 100 x 68.5 mm. United Kingdom, United States and Canada. Colour - Approx. Ink Jungle. Black - Approx. Add to favourites. Covered by full manufacturer’s warranty. Kodak: ESP 3 ESP 5 ESP 7 ESP 9 ESP 3250 ESP 3200 ESP 5000 ESP 5200 ESP 5250 ESP 5300 ESP 5500 ESP 7250 ESP 9250 ESP Office 6150 Hero 6.1 7.1 9.1. Original & genuine. Compatible with CAT 3949922. Manufacturer's Part No. Kodak: ESP 3 ESP 5 ESP 7 ESP 9 ESP 3250 ESP 3200 ESP 5000 ESP 5200 ESP 5250 ESP 5300 ESP 5500 ESP 7250 ESP 9250 ESP Office 6150 Hero 6.1 7.1 9.1. Compatible with CAT 3949922. Manufacturer's Part No. Kodak: ESP 3 ESP 5 ESP 7 ESP 9 ESP 3250 ESP 3200 ESP 5000 ESP 5200 ESP 5250 ESP 5300 ESP 5500 ESP 7250 ESP 9250 ESP Office 6150 Hero 6.1 7.1 9.1. Original & genuine. Manufacturer's Part No CAT 3949922. 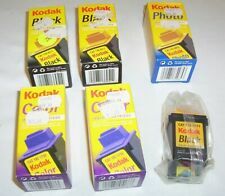 Kodak 30B Black and 30C Colour. Joblot of genuine and compatible cartridges. 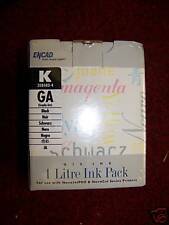 Kodak 10C Ink Cartridge. New & Sealed. 420 pages. 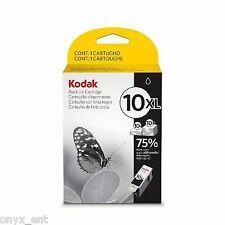 WHOLESALE BUNDLE OF 5 KODAK 30XL BLACK INK PRINTER SCANNER CARTRIDGES 670 PAGES. KODAK EASYSHARE PRINTER DOCK SERIES 3 + SPARE PAPER + Software-BOXED,ALL ACCS.